Have you eaten lupin today? Did you even think to check? Why would you? Some studies suggest that about half of those who are peanut allergic are also lupin allergic and that they will have a similar reaction if lupin is ingested. Where would I find lupin in my food? Firstly Lupin is on the EU list of ingredients that must be declared on food labelling. Secondly, there doesn’t seem to be that much lupin in food in the UK. Most of it seems to be in shops that import a lot of continental food such as ALDI or LDL … check the labels. Lupin allergy is a significant issue in France. 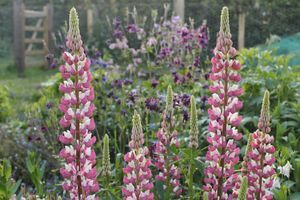 Lupin seeds can be eaten as a peanut-like snack (Lupini), or tossed into a salad or, most commonly in the UK, as an ingredient in flour in baked products, cakes and biscuits… check the labels. These foods can contain a significant amount of lupin flour and I have had a patient who reacted to one of these products as they hadn’t checked the labels. Lupin is also an ingredient in some gluten-free pasta – I have seen it in Heinz GF pasta (which I can highly recommend to you if you are NOT allergic to it). NEW INFORMATION. A fisherman has just told me that lupin is used in fish bait!! Be careful when handling it! If you are peanut allergic – find out if you are also lupin allergic … safely! If you spot lupin in an odd place, let me know and I will do my best to publicise it. PS If you are Nut Allergic - make sure you know what you are eating by taking the Name That Nut Challenge. Do you want a test for Lupin Allergy? - Book an appointment here.